Find a Coach / Bus trip that explores Ireland. There are 62 tours to choose from, that range in length from 3 days up to 14 days. The most popular month for these tours is June, which has the most tour departures. "It was our first international tour guide experience and it meet and exceeded my..."
"excellent tour. i love this"
"Shamrocker Tour Celtic Rocker (Dorm) This 5 day Celtic rocker tour was a good way..."
"My cousin and I had never been to Ireland before and signed up for the tour hoping..."
"Great tour - saw so much in a short time. Knowledgeable and professional tour director..."
"While it's not exactly aimed at the younger set, because you'll see all of the same..."
"More than I expected. Guide very friendly, knowledgeable, and went out of his way..."
"Jimmy was great and very knowledgeable. 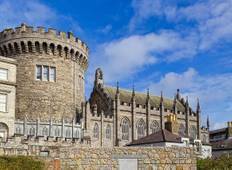 The accommodations were average but made..."
Sneak a peek at Ireland’s rich cultural heritage and dazzling natural wonders during a short tour of Dublin, Galway and the awe inspiring Cliffs of Moher. Visit the Tullamore Dew Irish whiskey museum, enjoy the vibrant atmosphere of Galway coast and explore the stone walls of Dun Aonghasa and the eerie coastal landscapes of Connemara. Savour authentic Irish heritage at a pub in Ennis or listen to hypnotic tales of bravado at the Blarney castle in Cork and kiss the famous Blarney Stone. Discover the romance of south and west Ireland, steeped in ancient lore. Drive around picturesque fishing villages and marvel at magnificent castles of Kilkenny and Bunratty, set amidst the rolling green countryside. Be fascinated with the spectacular coastline and dramatic natural splendour of Giants Causeway in the northern part of Ireland. Leave the city lights behind and marvel at the abandoned beauty of the Wicklow mountains. Bask in the views of stunning granite peaks rising out of the Atlantic Ocean at Dingle Peninsula. Pass through the legendary Ring of Kerry, one of the most scenic drives in the world. Get off the beaten track and explore lesser known gems such as Tipperary, Limerick and Cork on a small group tour of the Emerald Isle. Pack a waterproof jacket and an umbrella as rain is rather unpredictable in this region. Wear comfortable walking shoes with non-slip soles for strolls through museums and hillside cobblestoned streets. Leave some room in your luggage to accommodate souvenirs. The Euro is the preferred currency in Southern Ireland whereas the Great Britain Pound Sterling is accepted in Northern Ireland. There is no need to carry a lot of money as there are many ATMs along the way. It is preferable to dress in casual layers for the day and to pack smart casual wear for special evenings. If you’re carrying medication, pack adequate supplies of prescription medicines in the carry bag and store extra supplies in the stowaway bag. Connect with your fellow travellers as it will make the journey more interesting and fun. "The best way to see ireland! The best hostels ever, amazing local guides who know..."
"The trip was wonderful, all I’d hoped for!!"